The Faculty of Oral and Dental Medicine on January 14th, 2016, organized the second part of a workshop for staff members and teaching assistants aiming to increase awareness regarding the most recent fundamentals of evidence-based clinical research. 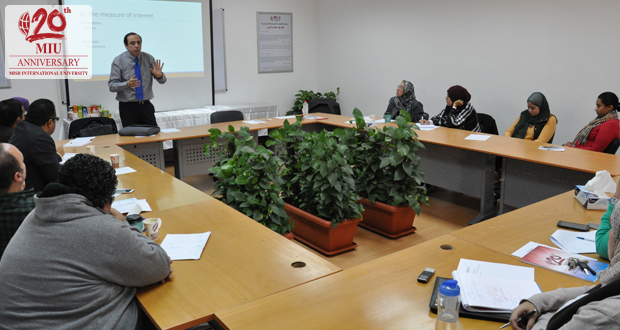 The workshop was led by Prof. Dr. Ashraf Nabhan, Department of Obstetrics and Gynecology, Ain Shams University. Professor Nabhan is Vice Chairman, Regional Research Committee for Africa and Eastern Mediterranean, HRP Alliance, WHO Associate Editor, Cochrane Pregnancy and Childbirth.